Lovely self catering holiday cottage in the attractive market town of Coja which is in the Arganil district only 40 kms from Coimbra. This property was renovated in 2007 to provide comfortable self catering facilities for your perfect holiday. Many original features have been kept such as the stone walls, large wood beams and the wooden shutters. There are 3 double bedrooms, 2 bathrooms, living room on the first floor with Portuguese satellite TV (includes some foreign channels), WiFi internet connection and wood burning stove for the winter. There is a door that opens on to the large balcony overlooking the river and across the valley to the mountains beyond. The kitchen and dining area are in the old converted wine cellar on the ground floor which opens out to the patio and garden with stone built BBQ and outdoor dining furniture. 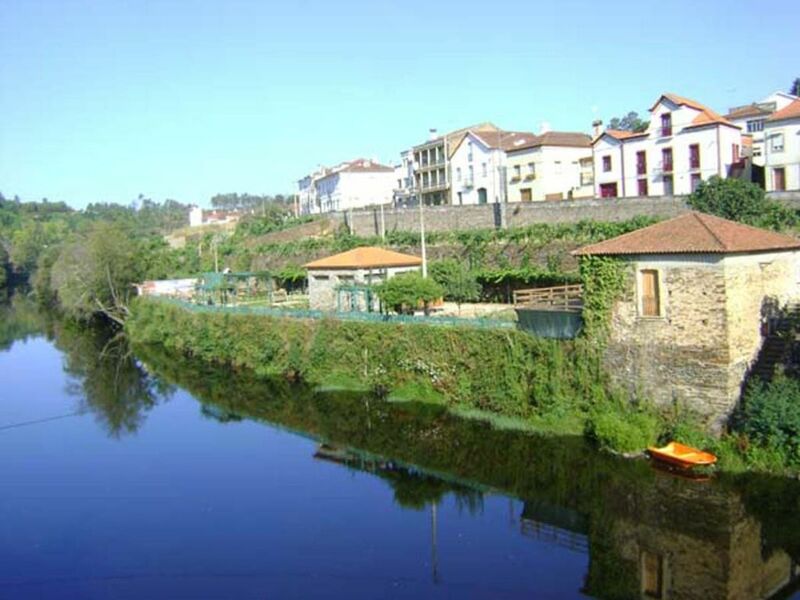 The house is 200ms to the river beach and 500ms from the town centre with cafes, restaurants etc. Coja is a small market town of approx. 1500 inhabitants in the district of Arganil only 40 kms from Coimbra. The Rio Alva runs through the centre and is spanned by an ancient Roman bridge to join the 2 halves. The house is situated in the more residential half overlooking the river and across to the old cobbled centre on the other side. Central Portugal is a beautiful, rural part of Portugal that remains relatively undiscovered by the hordes of tourists that are normally attracted to the Algarve in the South. There are forests and rivers, mountains and valleys, rural villages and ancient cities to explore. A beautiful area to come and explore or just relax! I moved to Portugal 10 years ago where I met my partner who quickly taught me how to speak Portuguese. I love the area around Arganil and Coja which is why I live here and why I am sure holiday makers will feel the same. The unique charm of a country cottage on the edge of a pretty market town was always going to be a favourite property for holiday makers and this has proved to be the case over the last 4 years with many repeat visits by people from all over the world. The house is in an excellent position for exploring the beautiful surrounding countryside. Closer to home the river beach is just 200ms where you can while away the hours swimming or hire a canoe for messing about on the river! There are oil filled electric radiators in the bedrooms. Logs are included in the price for the winter months. The high chair is the type that clips onto the table and is available on request. Really lovely stay again with glorious sunshine and real t-shirt and short weather! Nice location as easy 5 minute walk to lovely local shops and restaurants. House is nicely laid out and suited my older parents as they had easy access to the kitchen, own bedroom, bathroom and outdoor level sitting space with two tables ( one for the morning breakfast and one to catch the last of the daytime sun and beautiful sunsets). would certainly stay again ( now our 2nd time) and would recommend to friends and family. Don't miss the market at Tabua on sunday, Visiting Seia and Mount Torres! Excelente casa com ótimas condições. Não falta nada. Estamos ansiosos por voltar logo que possível! Excelent house Very good conditions. Nothing is missing. We are looking forward to be back as soon as we can. Large Cottage with gorgeous location and views! Jane is a fabulous hostess, very helpful and welcoming. Her cottage is a lovely place to stay for many reasons not least the gorgeous location overlooking the river in Coja. The outside space consists of an upstairs balcony and the downstairs has a large sunny terrace with incredible views. The facilities are all great! The house as a whole is really large with plenty of space to spread out. The kitchen is large and well equipped. There are 2 bathrooms, one upstairs and one down and one of them even has a bath! There were lots of personal touches around the house too which make it feel like a true home-from-home. Things like food basics in the cupboards was also very welcoming. The house is clean and tidy and everything is beautifully presented. Within walking distance is a lovely restaurant and river-side bar and over the bridge there are plenty of shops and small supermarkets. There is a market here too (details are in the house notes from Jane.) The small square in Coja is a lovely place to sit outside and enjoy the sunshine and a coffee or a glass of Portuguese wine. My partner and I stayed here around 3 weeks in November and the weather was surprisingly mild during the days when the sun was out. To keep warm in the evenings we had plenty of logs provided for the woodburner upstairs. I thoroughly recommend the place and hope to return one day. Thanks Jane for everything. Everything was as advertised. The cottage is lovely with everything you could possibly need. The situation by the river is perfect. There is a river beach in one direction and the village in the other. Both a few minutes stroll away. We woke up to hundreds of swallows catching insects as the mist rose from the river. A wonderful place to unwind or to travel to the hills and rivers nearby. I would highly recommend the cottage. Great place near the river! Spent a week with family at this charming cottage in the pretty little town of Coja. The weather was good and we explored the region by car finding some lovely little villages on our drives.Jane has provided a booklet with recommendations for trips, places to eat etc and this was very helpful. We will certainly recommend this to our friends and hope to come back one day! Wir verbrachten schöne Tage im geräumigen Ferienhaus mit urigem Ambiente. The surrounding countryside is very beautiful with lots of quaint, ancient villages to explore, wide rivers with crystal clear waters where you can fish or hire canoes and pedalos and lush green forests where you can tramp the dirt tracks. The rivers have lots of river beaches waiting to be discovered, some are very popular and maintained by the local councils where others, less well known, are dotted along the banks. You could have one all to yourself! A deposit of 20% is payable on confirmation of a booking. A 10% discount is given for a booking of 2 weeks or more. Prices are based on 6 people sharing. A lower price may be offered for less people depending on the season. An extra €20 is payable for a 7th person with an extra collapsible bed provided on request. Credit cards can be accepted using Paypal.